We will do our best to post our daily specials, news and events here. They are originally posted on Facebook, so make sure you like the Hilltop Restaurant and Bar Page for daily updates! Dinner Specials... it’s Wing night!!! 50 cents, all you can eat!!! Hilltop Restaurant & Bar offers a service and dining experience like none other in Western New York. Stop in and enjoy your favorite dish, or try something new today. Owners Tony & Crystal help you get to know a little about Hilltop Restaurant & Bar! Hilltop Restaurant & Bar creates a catering experience for your event like no other. Experience amazing food and dessert options tailored to fit your special day. 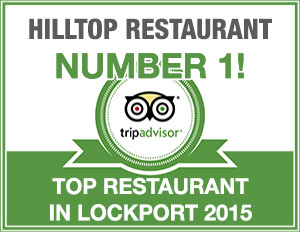 Call 716-433-7060 to book Hilltop Restaurant & Bar for your event today! Stop in and enjoy a wonderful freshly served meal to start, or top off the rest of your day. -Bacon Wrapped Meatloaf Smothered with Gravy topped with Tobacco Onions, over Redskin Mashed Potatoes, and Garlic Green Beans. Served with our Daily Baked Bread, Flavored Butters and Soup or Salad. looking for some tasty prepped meals. Hilltop is now offering solution. check out the menu, orders in by tonight are available for pick up tomorrow.